Sometimes I like to have a go at using a recipe or ingredient mix that most people wouldn’t think about trying together. Yesterday whilst chopping up vegetables for my ratatouille dinner I thought how nice it would be to make sweet courgette muffins. 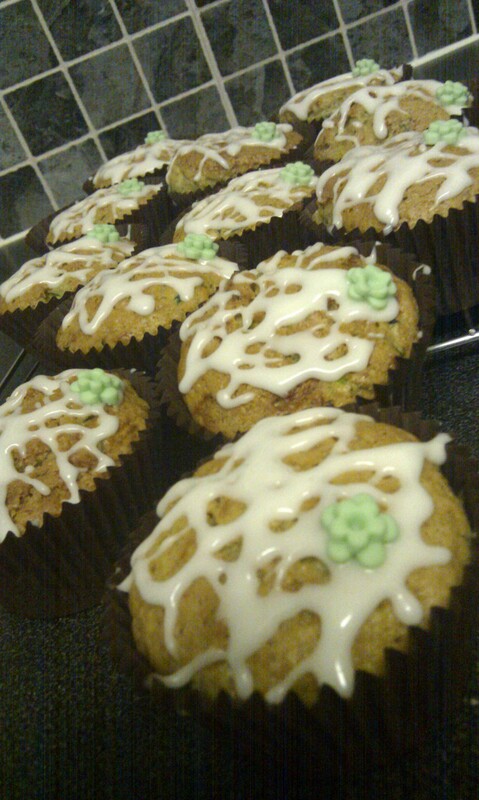 I have made cakes and muffins using vegetables before like carrot and beetroot cakes so why not courgettes? I know that some people worry that the cakes are going to taste like a vegetable (my husband included) so often are really nervous about trying them; however, all the vegetable does is increase the texture of the mix to make it lovely and moist. Courgettes can be pretty plain on their own so I wanted to add another taste in there as well. By grating the courgette with the skin on it would leave flecks of green in the final cake, so using the colour as a good starting point, I decided on lime – I always have lime juice in the fridge. As I didn’t have a fresh lime, adding the rind wasn’t a possibility, though next time I would definitely grate the rind and add it into the mix – and I would recommend you do to. I thought that a nice sharp icing would be the best way to get the flavour of the lime without overpowering the muffin so I decided a lime drizzle would be best. In the end the recipe I decided on was Nigella Lawson’s, only without raisins and the cream cheese topping. Cream cheese is lovely, but when the muffins are going to have a car journey into work, I though they might get a little messy! Icing sugar mixed with lime juice – enough to create a runny icing. Grate the courgettes and either leave to sit in a colander or gently squeeze in a clean tea-towel to drain off excess water. In a mixing bowl add the dry ingredients of sugar, flour, bicarb of soda and the baking powder. Give them a little stir to mix. In a separate bowl mix together the oil and eggs then add to the dry mix. Give these a stir together until mixed – don’t worry if the mixture looks a little lumpy, this is a good look for muffins. Once nearly mixed add the courgette and lime zest (optional) and gently mix in. Divide the mix into 12 muffin cases and bake for 20-30 minutes. Check after 20 minutes with a skewer and if it is clean then they are done. Cool the muffins on a wire rack and then drizzle with icing sugar mixed with lime juice. I might also try this recipe as a cake baking it in a 8” round tin. When cooling, poke it with holes, heat up sugar and lime juice till the sugar dissolves and then drizzle all over.